"Fiery harissa and smoky paprika in a mayo base stand up to the distinctive flavor of mighty wild salmon." Preheat oven to 425 degrees F (220 degrees C). Coat the inside of a 9x12-inch baking dish with vegetable oil. Sprinkle the salmon with salt and pepper, and place into the baking dish. Arrange the lemon slices and onion rings on the salmon. In a bowl, mix together the mayonnaise, lemon juice, harissa, and smoked paprika until the mixture is smooth and well combined. Spread the mayonnaise mixture over the fish, lemon, and onion slices, getting the sauce onto the fish. Pour the orange juice and wine around the salmon. Bake in the preheated oven until the fish is hot and has begun to turn opaque, 10 to 12 minutes. Remove the baking dish from the oven, set a broiler rack to about 5 inches from the broiler, and turn the broiler on. Broil the fish until nicely browned, about 3 minutes. You can place the onions and lemon slices on the salmon after spreading the sauce, but they can burn under the broiler. This is a very good recipe. 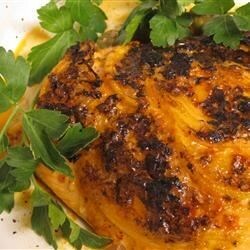 I used the harissa recipe on this site - easy to make and tastes wonderful. Husband and teenage kids loved it. There were no left overs. Turned out excellent!!! I made for 1.5 oz. fillets and they were almost all gone by the time I got a chance to make a plate... Thanks!! !